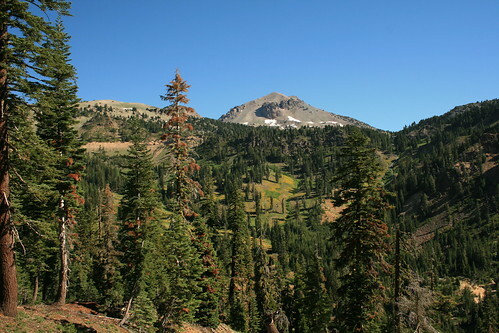 Lassen Volcanic National Park is in the southern section of the Cascade Mountain range which connects with the northern part of the Sierra Nevadas. It is snow-free only two or three months of the year! We figured that now was the time to go and visit it, since the road is usually closed more than it is open. It was kind of a last minute decision to go, which made it even more fun. We left Friday afternoon from Oakland and headed north along I-5 until we got to Red Bluff, which is just south of Redding. From there we took HWY 36 into the Lassen National Forest to camp for the night. It was pretty dark when we finally got to the forest boundary, so we just turned on our bright lights and turned off on the nearest forest road. The road kept climbing up a mountainside with pretty steep drops or walls to either side. Finally though, it leveled out and we found a spot to camp for the night where somebody already made a huge firepit! I had our fire permit in my purse, so we made a campfire and had some tortilla chips for dinner. 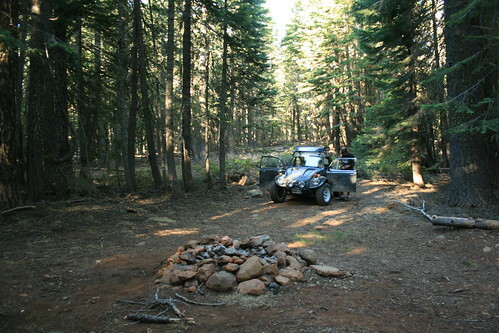 Our campsite in the Lassen National Forest. The next morning we got up as early as we could (but we didn't get to sleep until about midnight the night before) because we wanted to see a lot of the park - as much as we could that day. But first, we had to stop for some coffee in the town of Mineral, just outside of the park. Then with coffee in hand, we were ready to enter the park, which only cost $10, but our year pass was still valid so we didn't have to pay. The first spot we hit was the geothermal area and Little Hot Springs Valley, which was once the interior of a huge volcano that blew itself up. The magma chamber was still feeding heat to some geothermal features, like boiling mud pots, fumaroles, and hot springs. It looked like a mini Yellowstone. On one of the signs, we saw a picture of Bumpass Hell, another geothermal area which was a 1.5 miles hike away, so we decided to go see that too. 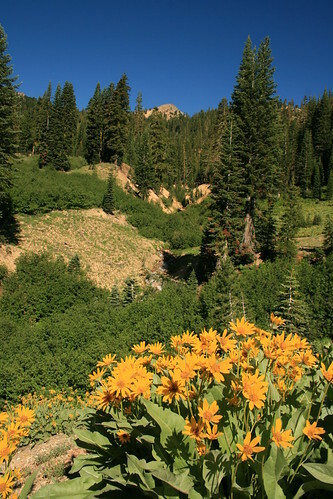 Yellow wildflowers in Little Hot Springs Valley in Lassen Volcanic National Park. Mt Lassen lurks in the background and the eye. The area got its name, Bumpass Hell, because there was a guide named Mr Bumpass, who used to take people to the area. One time he walked on the geothermal area when he was giving a tour, where the crust was too thin, and his leg broke through and fell into the boiling hot mud just below the surface. It was mud, so it stuck on him, but it was also boiling hot! He was severely burned and lost his leg as a consequence. A panoramic photo of the Bumpass Hell area. We saw a bunch of mud pots, fumaroles, and hot springs (again) but they were very colorful here. There was even a roaring fumarole which sounded like a quiet jet engine with a huge amount of steam gushing out of it. The whole area had a boardwalk so that you could walk and see everything elevated off of the thin fragile crust. In some areas, parts of the boardwalk were engulfed by the every changing hot springs. 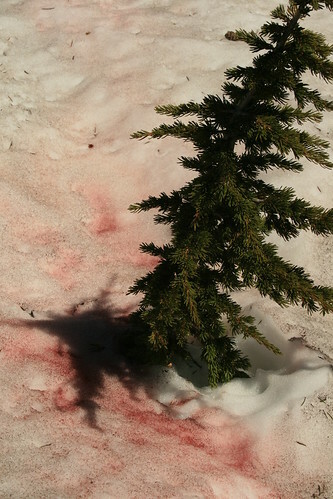 There was a lot of snow still on the trail to Bumpass Hell. We even found an informational sign (about the story of Mr. Bumpass) still almost completely covered by snow. Pink snow algae is alive and lives on the frozen surface! 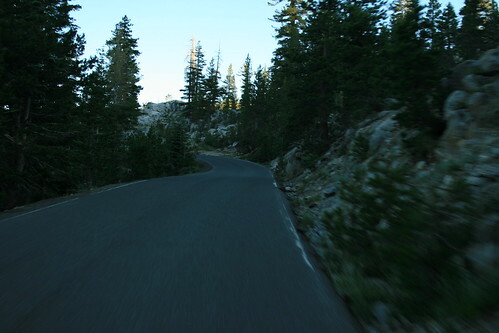 Next, we continued the drive through the park on Hwy 89, which took us past the base of Mt Lassen. There was even more snow there and along the side of the road we found snow algae growing on the surface. It is a type of extremeophile which lives quite contently on the snow during summer. It was bright pink! Aside from that, the rest of the road went past a lot of forest scenery and gave access to a lot of trailheads for hikers. Soon we were out of the park, but there were other things we still wanted to see. 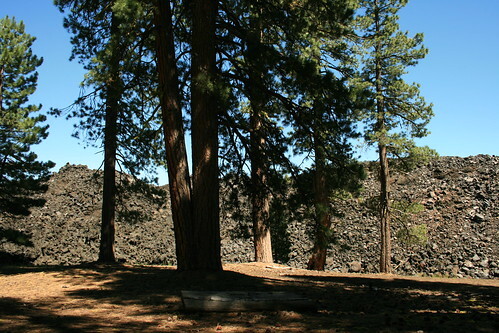 In the northeast section of the park was the Fantastic Lava Beds and the famous Cinder Cone trail and Painted Dunes. To get there, we had to first drive out of the park, and then drive down a forest road which took us back into the park. It was a bumpy gravel road, but no biggie in the baja. At the edge of the flow which created the Fantastic Lava Bed, along the trail to the cinder cone. We found the trail that led to the cinder cone, which started from the Butte Lake campground area. Along the way, we hiked past the edge of the lava flow that created the Fantastic Lava Beds (I'm not making up the name! ), which up close looked like a bunch of lava rocks piled on top of each other. The ground we were walking on began to get sandy, but it was black, like sand that was created from broken up lava, which was all around us. 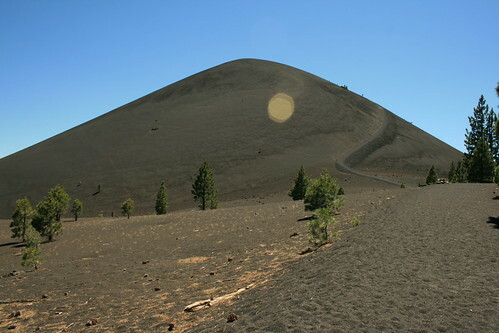 Approaching the cinder cone, which rises 700 ft above the lava beds. 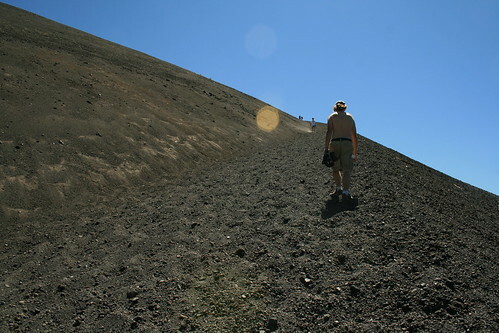 Soon we reached the cinder cone and we started going up. Imagine climbing a huge dune. We were lucky that there was a nice strong cool breeze blowing because otherwise it would've been really hot, with all of the black lava under our feet. The cinder got in our shoes, in between our toes, and in our socks, which was a little annoying, but we were determined to get up. It took us about 1/2 hour to get all the way up because we climbed so slow and took a lot of breaks. Finally, we got to the top. The cone's color was more reddish on top because of the rust that forms from the iron-rich cinder and lava. And the wind was even stronger! It blew my sun hat off many times. We took a walk around the entire top of the cinder cone and then found one of the only trees up there and sheltered ourselves from the wind for a break. We had a view to the east, over the painted dunes (colored from rust), Butte Lake, and of course, the Fantastic Lava Beds. Panoramic photo of the top of the cinder cone. You can see Lassen to the right. We were the only people on the top of the cinder cone, which was amazing for being Saturday afternoon. 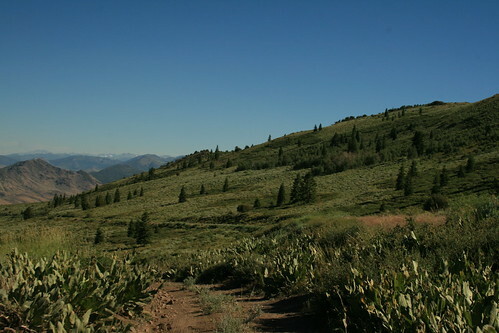 But that only lasted for about 45 minutes, and soon more people came up the steep trail. So we decided to go down, which was much easier than climbing up! When we got back down to the trail along the lava beds, we smelled a sweet vanilla scent in the air. It was the pine trees! The bark of some pine trees in the Sierras smell like vanilla cream soda. I think that is really cool! 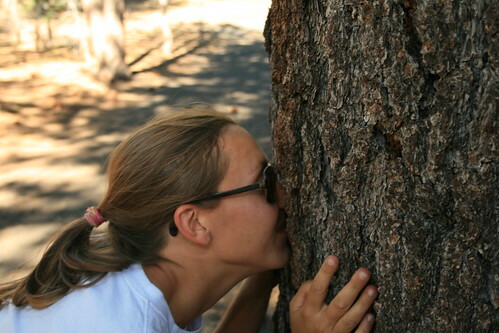 Some pine trees smell like vanilla cream soda when you smell their bark. It was so strong on the trail, it was carried by the breeze, almost like somebody cracked open a soda on the trail! After hiking 4 miles round trip, we were pooped, so we headed out of the park and into the surrounding national forest to find a camping spot. We weren't very lucky finding a spot where somebody already camped before, so we picked a level area and had to build a new fire ring. After dragging all of the large rocks we could find in the area, we had to start collecting wood, which was no problem since there was downed wood everywhere. And the wood was extremely dry too so starting the fire was as easy as putting my lighter to a twig. No paper or anything needed. One lit twig started the entire pile of wood in the fire ring, which made me think of how easy it would be for somebody to accidentally start a whole forest fire. For example, if you were smoking and dropped your cigarette or something. Some national forests in California suspend campfire permits in the summer, but Lassen did not (yet) so we were allowed to have our fire that night. However, when we drove home the next day, all of the other forests we drove through had big signs reading "burning suspended." That night we almost had another sasquatch encounter, but it turned out to be nothing. We were sitting around the fire, and it was starting to get dark. The birds were still singing. All of a sudden we heard a loud moan in the forest, but it sounded more like a trumpeting. All of the birds and even the chirping bugs stopped singing. It was dead quiet as everything in the forest paused to listen in confusion over what the heck that was. Even we turned our heads and listened to what might be lurking in the forest behind us. But it was nothing and we never heard anything unusual for the rest of the evening. Driving off road in the Toiyable National Forest. 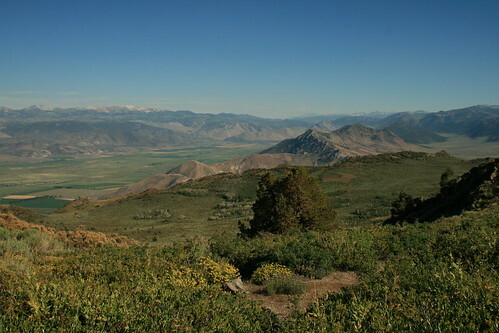 The next morning we headed off east to get to Hwy 395. We decided that we had time to take a nice drive along my favorite highway from Susanville, CA, through Reno and Carson City, NV, back into California at Topaz Lake, and then over the Sierras on Hwy 89. Then from Hwy 89 we took the turnoff for Hwy 4, which we've never driven on before. It is one of the first highways to close when winter snow hits, and one of the last highways to open in the late spring (I don't think it opened until June this year). We figured it must be good if the snow plows don't even attempt to plow it. So off we went. But before we got to the highway turnoff, we were distracted by all the dirt roads that went off into the high country at Monitor Pass, which stands at 8,314 ft. Our excuse to go joy riding through the Toiyabe national forest was that we were scouting out yurting spots in the mountains. Its our plan to go relocate ourselves one summer for a couple of weeks and live out of the yurt. We are in the process of looking for solar panels that we could put on the roof so that we could power our laptops and still work on research while in the middle of nowhere in the yurt. View south, towards Bridgeport. We want to put the yurt here one summer an have this view! After close to an hour of exploring and stopping to take in the amazing views from the top of the mountains, we decided to finally get on Hwy 4. It followed a river for the beginning of it, and then it started climbing over the Sierras. Then the road turned into a one and a half lane road, with no center stripe! We couldn't believe that it was a real state route and not a paved forest road. There were thousand foot 'death-drops' sometimes to either side of the road, and nobody drove very fast for fear of missing on of the hairpin turns and falling off the Sierra Nevada mountains! We drove over huge granite domes and past small alpine lakes. There were awesome cabins secluded in the forest here and there, and I was sooooo jealous of whoever owned them! Driving down Hwy 4, which was one lane for most of the drive across the Sierras! It was so cool! The sun was setting just as we got out of the mountains and into the valley. But I think the valley is boring so it didn't matter that it was dark already. In fact, maybe it was better that we didn't see Stockton while driving through it. We finally got home really late, and as always, I wished I was still in the Sierras! We want to go back again, of course. We always want to go back to the mountains as soon as we've left them!